Bhate A*, Joshi D** , Chitnis S***. Adnexal torsion (AT) in pregnancy is a rare condition which presents as an acute abdomen. The diagnosis may be missed because of accompanying non-specific signs and symptoms. Diagnostic laparoscopy followed by detorsion and cystectomy, offer fair chances of saving the adnexa as well as facilitate early recovery. We present a case of acute torsion of a large para-ovarian cyst which was treated by laparoscopy, where both ovary and fallopian tube could be preserved. Adnexal torsion remains a rare emergency which eludes diagnosis. It must be considered as a differential diagnosis in pregnant patients presenting with acute pelvic pain. It has similar presentation in pregnant and non-pregnant women, although underlying pathology may be different. There has been an observation that majority of cases in pregnancy are associated with functional cysts. Torsion during pregnancy occurs primarily in the first or the second trimester. Torsion in pregnancy is increasingly being reported due to liberal use of ultrasound in pregnancy, which also happens to be the most valuable tool in diagnosis of torsion. Earlier, all cases were treated by laparotomy and adnexectomy. This now has been popularly replaced by laparoscopy due to its associated safety, faster recovery and minimal risk to the fetus. A 23 year old primigravida visited antenatal clinic for the first time with 5 months of amenorrhea associated with pain in abdomen. Pain was dull aching in nature, non-radiating and aggravated by activity. She had no other complaints such as vomiting or fever. She had conceived spontaneously and had an uneventful pregnancy so far. She appeared pale but had stable vital parameters. Uterine height corresponded to 24 weeks of gestation. She was admitted and started on intravenous isoxsuprine and micronized progesterone. Investigations revealed iron deficiency anemia and leucocytosis (hemoglobin of 7.6 g/dL and white blood cell count of 12,300/cmm). Her liver and renal function tests, urine routine and quadruple markers were normal. Ultrasound scan for anomalies was done. It showed a 19-20 weeks’ fetus in changing lie with prominent renal pelvis. A simple cyst of 10.4x7.2 cm was noted in the left adnexa with scanty flow in pedicle. Bilateral ovaries were seen separately and were normal in size. She had not undergone any investigations in the past, thereby the duration of adnexal mass could not be determined. Diagnosis of left adnexal torsion was made and decision for performing a laparoscopy was taken. She was transfused with 1 unit of packed cells prior to surgery. Peritoneal access was gained with supraumbilical port and lateral ports under general anesthesia. 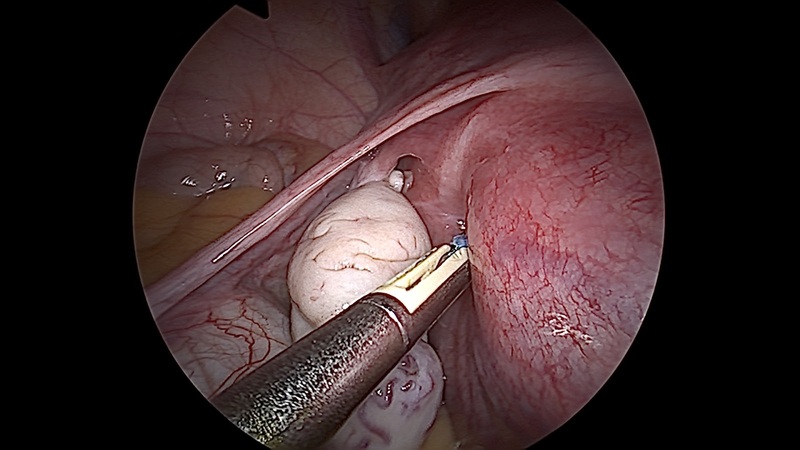 Port placement was higher than usual in order to prevent injury to the uterus. Upon entry into the abdomen, a left para-ovarian cyst with single twist of its pedicle was noted. 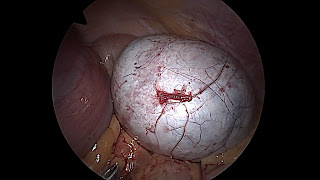 Fallopian tube was stretched over the cyst. The left ovary was normal. Right ovary and fallopian tube were normal. Pedicle was derotated and cyst was enucleated. Cyst contents (clear straw colored fluid) were drained. It was a simple cyst with no solid component. The excised cyst wall was sent for histopathology. There was no compromise to ipsilateral fallopian tube and ovary. Post-operatively, the patient recovered uneventfully with no obstetric complications. Figure 1. Gravid uterus (U) and the paraovarian cyst (C). Figure 2. Gravid uterus (U) and the paraovarian cyst (C), Ovary (O), Tube (T). Figure 3. Retracting the gravid uterus. Figure 4. Incision for enucleating the cyst. Adnexal masses may be found in 0.19-8.8% of all pregnancies. Adnexal torsion is an emergency which warrants early diagnosis and treatment to prevent complications. A low incidence of 1-5 per 10000 pregnancies makes it a diagnostic dilemma. Incidence of adnexal torsion rises considerably in pregnancies achieved after assisted reproductive techniques. Medial torsion while considering infundibulopelvic ligament as the reference point has an overall higher incidence. In pregnancy however, lateral torsion is not uncommon and may be seen in as high as 35.6% women. Symptoms are commonly non-specific, with pelvic pain being the commonest complaint. The patient may also have nausea, vomiting and fever. White blood cell count is frequently elevated. Outcome of pregnancy is variable and depends on gestational age. Ultrasound is the most commonly used diagnostic tool. Presence of symptoms (nausea and vomiting), elevated leukocytes and ovarian cyst > 5 cm in diameter are indicative of torsion and aid in diagnosis. Magnetic resonance imaging may be used to aid diagnosis in doubtful cases. Several approaches have been used for surgical intervention in adnexal torsion, e.g., laparotomy (Pfannenstiel, midline vertical incision or para-rectal incision). Laparoscopy is a reasonably safe technique for establishing diagnosis and treatment in the same sitting. It may be carried out in any trimester with minimum risk to mother and fetus, although peritoneal entry may be problematic in advanced gestation. Entry through Palmar’s space, located in the mid clavicular line 3 cm below the coastal margin, is a suitable alternative in such cases. 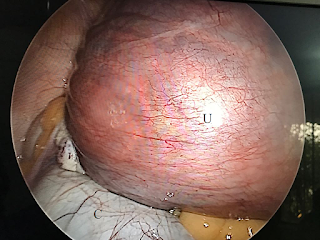 This approach is especially useful in cases where problems are anticipated in umbilical entry, as in presence of large fibroid, peritoneal adhesions and as in our case an enlarged gravid uterus. Entry may be made by Veress’ needle or small sized trocar and cannula. Our patient presented with pain in abdomen. She was admitted and swiftly investigated to reveal a large adnexal cyst with reduced flow in the pedicle along with anemia and leukocytosis. Peritoneal access during laparoscopy was a concern, hence supraumbilical port was placed 3-4 cm above the usual location. Lateral ports were placed under vision. Adnexal torsion in pregnancy is rare and clinical diagnosis is difficult due to vague symptoms and signs. Doppler ultrasound is a useful tool to diagnose torsion by detecting absence or presence of vascularity in the pedicle. It is also helpful in assessing whether the patient needs adnexectomy. Laparoscopy can be safely used for treatment of adnexal torsion with good surgical and obstetric outcomes. It also has the advantage of less discomfort and early recovery. In advanced gestation entry through Palmar’s point or open laparoscopy may be preferred in order to avoid penetrative injuries. Early surgical intervention in adnexal torsion is the key to prevent loss of vascularity in adnexae. Adnexectomy can be prevented by timely treatment of torsion. Bouguizane S, Bibi H, Farhat Y, Dhifallah S, Darraji F, Hidar S, et al. [Adnexal torsion: a report of 135 cases]. J Gynecol Obstet Biol Reprod (Paris). France; 2003 Oct;32(6):535–40. Melcer Y, Sarig-Meth T, Maymon R, Pansky M, Vaknin Z, Smorgick N. Similar But Different: A Comparison of Adnexal Torsion in Pediatric, Adolescent, and Pregnant and Reproductive-Age Women. J Womens Health (Larchmt). 2016;25(4):391–6. Fouedjio JH, Fouogue JT, Fouelifack FY, Nangue C, Sando Z, Mbu RE. [Torsion of uterine appendages during pregnancy: report of a case at Yaounde Central Hospital, Cameroon]. Pan Afr Med J. Uganda; 2014;17:39. Cavaco-Gomes J, Moreira CJ, Rocha A, Mota R, Paiva V, Costa A. Investigation and Management of Adnexal Masses in Pregnancy. Scientifica (Cairo).2016;2016:3012802. Bras R, Braga J, Tome A, Ferreira H. Adnexal Torsion in the First Trimester of Pregnancy: Diagnosis, Laparoscopic Management, and Review of the Literature. Surg Technol Int.2017;30:210–4. Hasson J, Tsafrir Z, Azem F, Bar-On S, Almog B, Mashiach R, et al. Comparison of adnexal torsion between pregnant and nonpregnant women. Am J Obstet Gynecol. 2010 ;202(6):536.e1-6. Krissi H, Hiersch L, Aviram A, Ashwal E, Goldschmit C, Peled Y. Factors Affecting Adnexal Torsion Direction: A Retrospective Cohort Study. Gynecol Obstet Invest. 2016;81(5):405–10. Chang S-D, Yen C-F, Lo L-M, Lee C-L, Liang C-C. Surgical intervention for maternal ovarian torsion in pregnancy. Taiwan J Obstet Gynecol.2011;50(4):458–62. Basaranoglu S, Agacayak E, Tune SY, Icen MS, Turgut A, Peker N, et al. Clinical experience in pregnancies complicated by adnexal torsion. Clin Exp Obstet Gynecol. 2016;43(3):345–9. Weiner E, Mizrachi Y, Keidar R, Kerner R, Golan A, Sagiv R. Laparoscopic surgery performed in advanced pregnancy compared to early pregnancy. Arch Gynecol Obstet. 2015;292(5):1063–8. Ramcharan P, Flynn M, Berkshire Grant G. You have to prove yourself all the time: People with learning disability. In: Grant G, Goward P, Richardson M and Paul Ramcharan P editors. Learning Disability: A life cycle approach. 2nd ed. England. McGraw -Hill Education. Open University Press. 2010; p. 311–28. Arena S, Canonico S, Luzi G, Epicoco G, Brusco GF, Affronti G. Ovarian torsion in in vitro fertilization-induced twin pregnancy: combination of Doppler ultrasound and laparoscopy in diagnosis and treatment can quickly solve the case. Fertil Steril 2009;92(4):1496(e9-13).